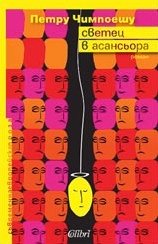 “Simeon the Liftite: A Novel with Angels and Moldavians” is the most successful and translated book of Petru Cimpoeşu. It has brought to him huge fame and many awards in Romania as well as in many other European countries. The story in the novel is presented self ironically and with a bitter sense of humour, offering us a recipe for reading and rationalizing our past, our life within the block of flats, and our own values. Petru Cimpoeşu is one of the most eminent contemporary Romanian writers. His books are translated to Spanish, Italian, Czech, Croatian, Hungarian and Hebrew. He is a favourite author of the Romanian public and has been bestowed 13 Romanian and international literary awards.